We were approached by a couple from Poole who were looking to make their home more accessible due to unforeseen circumstances. Poole is located on the South coast and similar to many seaside towns and villages, the land undulates around the coastline. The client's home was no different with the driveway and garage situated at the street level then their house situated at the top of the hill. The garden then sat between the two with a paved pathway leading from the driveway all the way up to the front door. After several discussions between the clients and our team we decided that an inclined wheelchair platform lift would be the best option. The main issue that became immediately apparent is how the pathway winds up the side of the garden. The pathway includes several twists and turns with some points narrower than others. We attended site and completed a digital survey, mapping the exact dimensions of every single step. 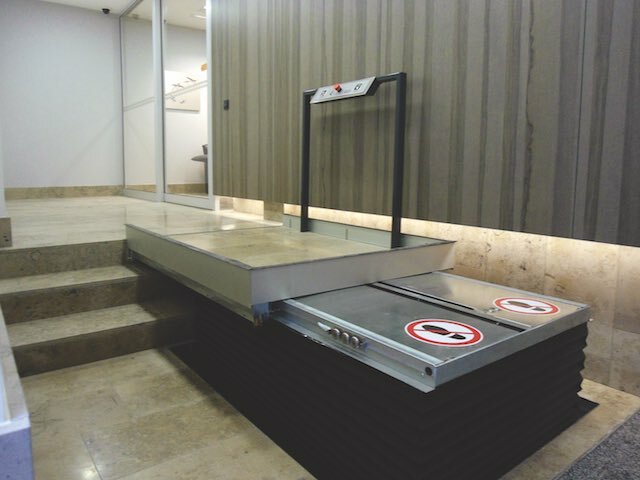 The survey revealed that the total distance the inclined wheelchair platform lift would travel would be over 13 metres and a total rise of 5 metres. This is by no means our longest inclined platform lift but it posed a unique challenge due to the number of turns and the narrowness of the pathway. We managed to fit an inclined wheelchair platform lift with a platform measuring 750mm x 1000mm. 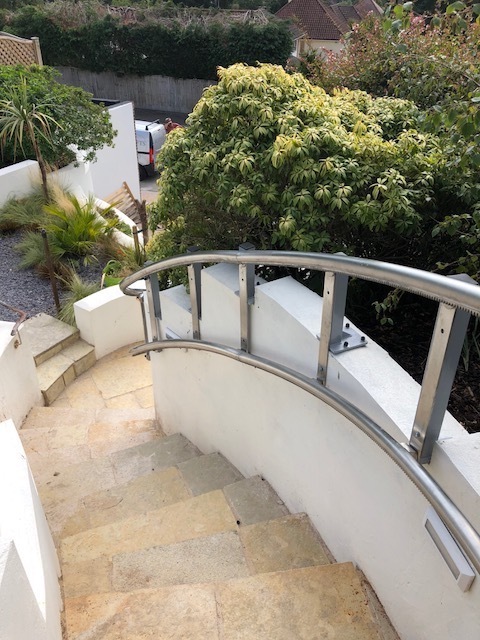 All materials of the lift are made out of 316 stainless steel to prevent any rust or corrosion meaning that the lift can stand up to any adverse weather conditions. After completing the project the client had this to say, "I wanted to thank you and your team for all your help, hard work and knowledge, your service has been amazing. Your engineers in particular were unbelievably helpful. "You enabled us to carry on living in our lovely house." 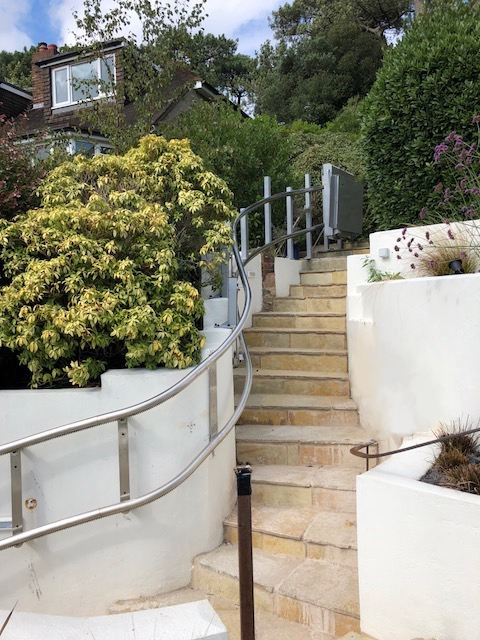 To see more examples of our outdoor lifts and garden lifts click on the following projects: Outdoor Inclined Platform Lift in Dartmouth, Outdoor Garden Platform lift in Parkstone, Residential Glass Lift in Bosham, External Home Lift in Branksome, Outdoor Home Lift in Powys and Outdoor Stairlift in Kingswear. We were approached by a couple who lived in Witchampton, just North of Wimborne, because they were looking to have a small residential lift installed in their cottage. The couple were looking to make their cottage more accessible and provide another access route to the upstairs of their home that would be close to the master bedroom. 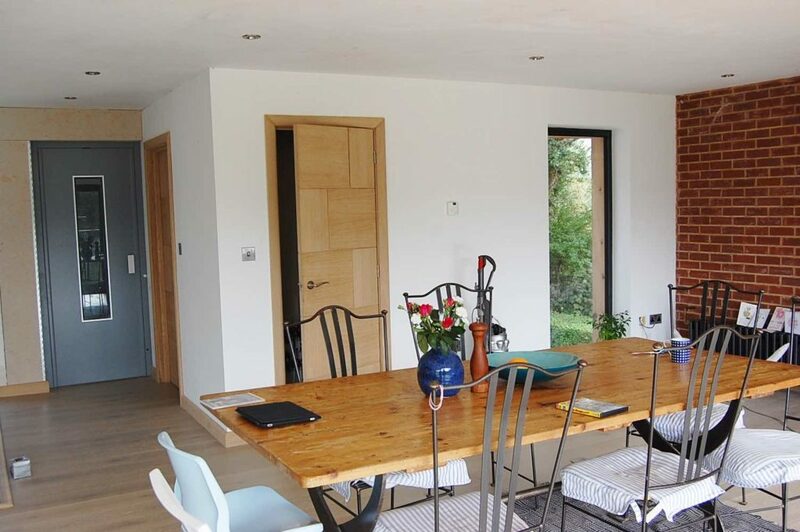 The most feasible option was a small residential lift to the right of the front door - the major sticking point for the project was that the cottage had sloping ceilings and so reduced headroom on the first floor. 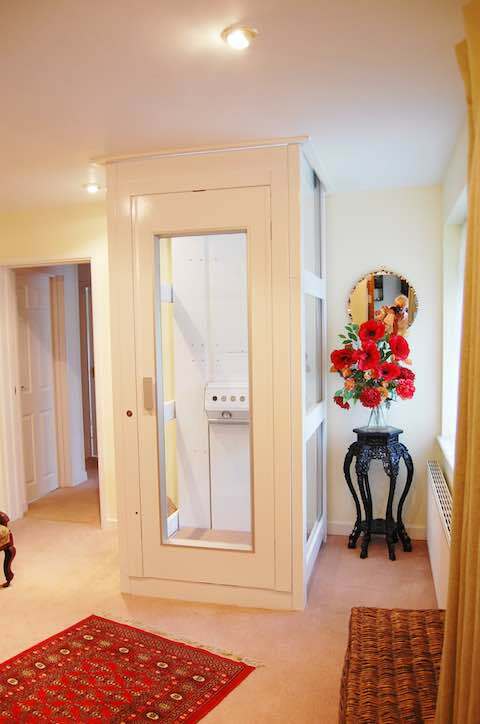 We designed and installed a small residential lift that was situated inside the cottage travelling 2550mm from beside the front door to the first floor landing, close to the master bedroom. Due to the reduced space and lack of headroom in the cottage the lift had a cabin that measured 850mm x 720mm and height that measured 1100mm. 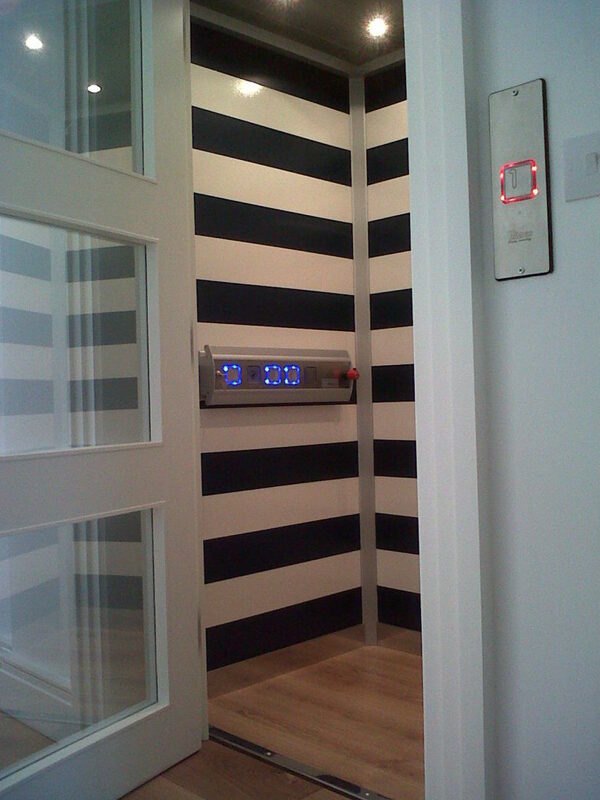 The small residential lift was finished in a painted stainless steel structure with glass panels. The glass panels and white painted structure allowed in as much light as possible to dissipate from the window above the lift shaft on the first floor. 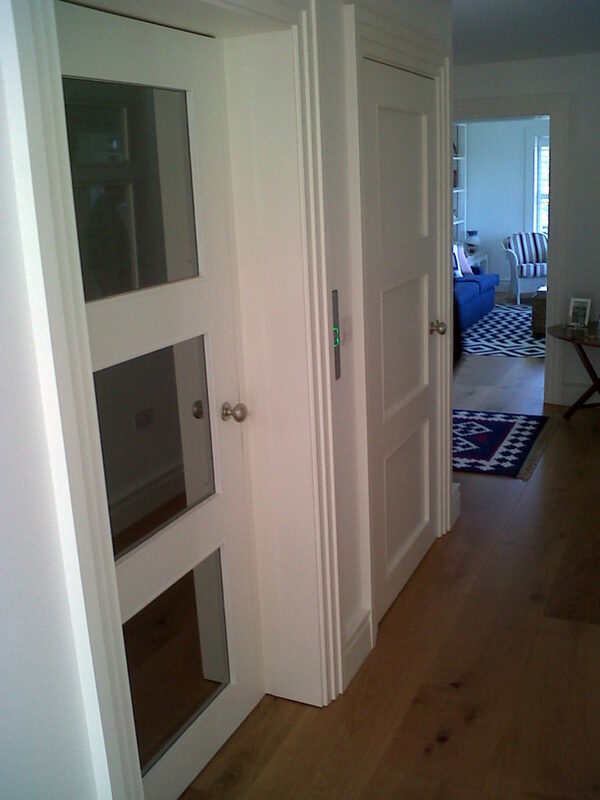 We fitted the lift with glass swing landing doors so that they took up as little space as possible as well as letting as much light flood through the house. 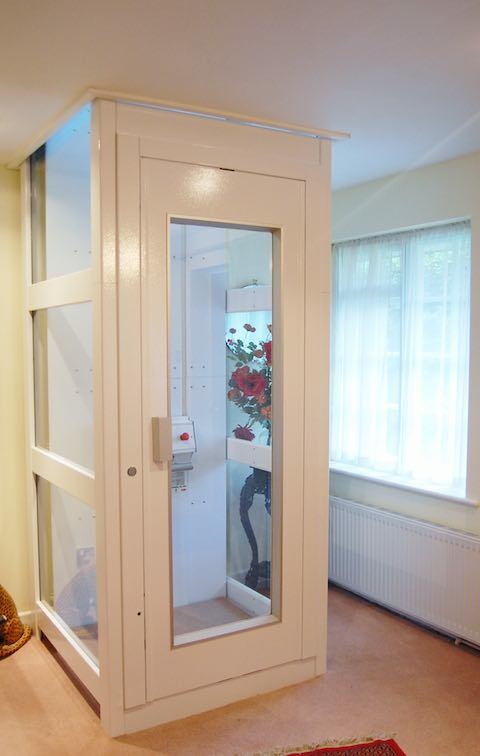 To see more examples of our residential lifts click on the following links: External Glass Lift in Branksome Park, Outdoor Lift in Powys, Glass Stairwell Lift in Torquay, Lift in Flats in Weymouth, Small Domestic Lift in Mayfair and Glass Residential Lift in St John's Wood. 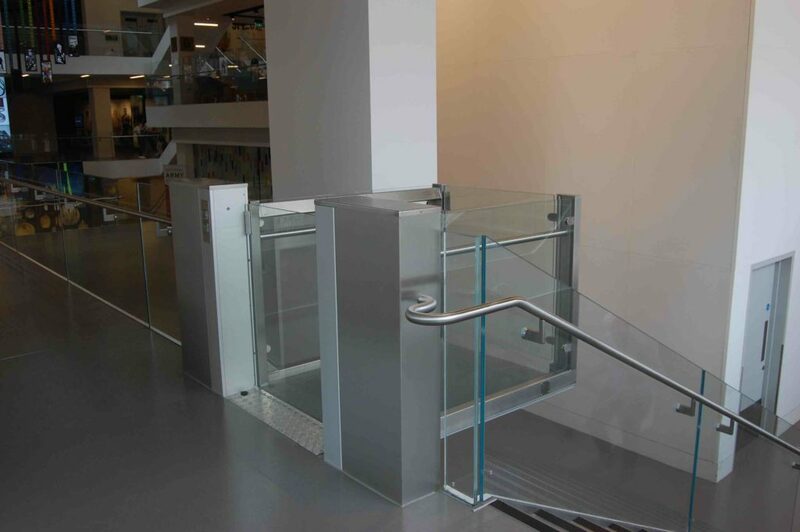 We are proud to introduce a new exciting disabled access solution. SwingOn is a genuine alternative to conventional disability ramps, outside stairlifts and inclined platform lifts. 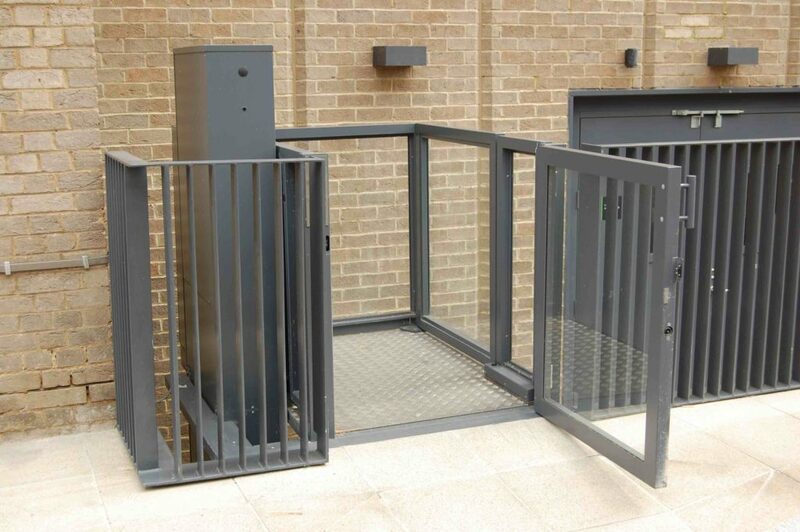 It is an innovative design that allows easy disabled access up to a maximum height of 500mm. SwingOn has the advantage against conventional disability ramps and inclined platform lifts. This is because it takes up a fraction of the space of ramps and platform lifts. 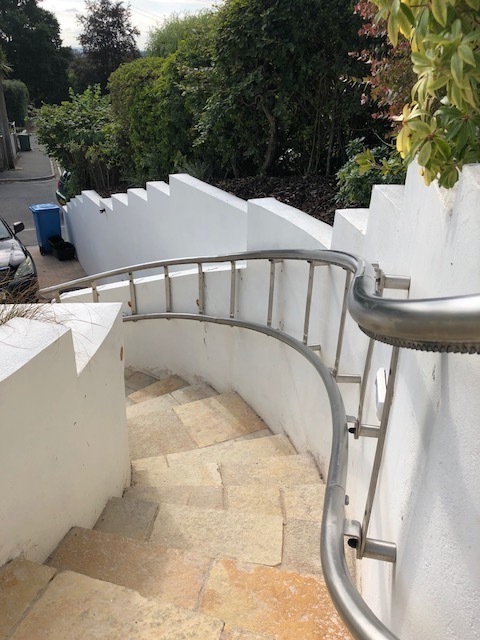 UK Building Regulations state a disability ramp has to have a maximum gradient of 1 in 12 for a total rise of 166mm rising to a maximum gradient of 1 in 20 for a total rise of 500mm. 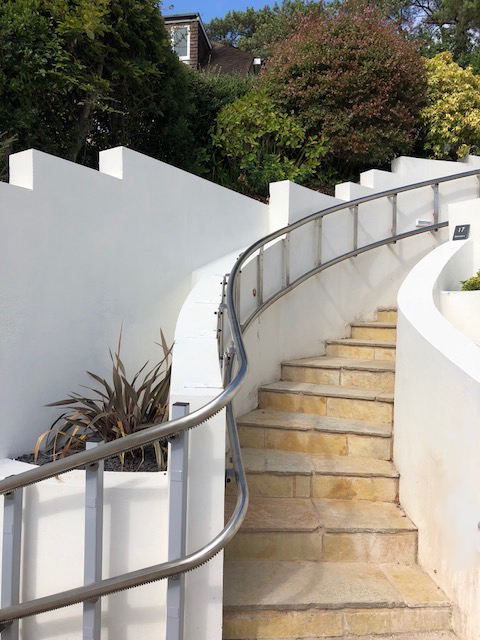 This means that for a 500mm rise from the pavement to the top of the steps you will have to build a ramp that is 10 metres long. This coupled with the ramp's 1.5 metres width means the total area is at least 15m2. This can be inviable and impractical therefore the best option is SwingOn. SwingOn features a telescopic platform that can measure between 830mm - 1400mm in length and 700mm in width. This means it can accommodate a variety of different wheelchairs and mobility scooters. Its safe working load is rated at 300kg which means it can lift even the heaviest of electric scooters. SwingOn is easy to install, taking only 1-2 to fit, with a simple plug and play connector so it can be used straightaway. It is easy to use and even easier to pack away, the compact design allows for it to be stored against a wall neatly. It comes in a number of colours so it can seemingly blend into its surroundings. SwingOn is made to last! All components are tested to European Standards to resist both hot and cold temperatures as well as high humidity levels. And the best thing about SwingOn? It's affordable! To see some of our commercial projects click on the following links: Venture House, Telefonica Digital, Seven Dials, National Army Museum, Southwark Council and Chiswell Street. To see some of our residential projects click on the following links: Witchampton, Chichester, Bosham, Whitecliff, Mayfair and St John's Wood. Restaurants along with hotels and shops can find it difficult to maximise space when it comes to disabled access. They sometimes see disabled access as something they have to have rather than maximising its potential and the potential of the restaurant. Disabled access for many restaurants takes the form of a ramp. 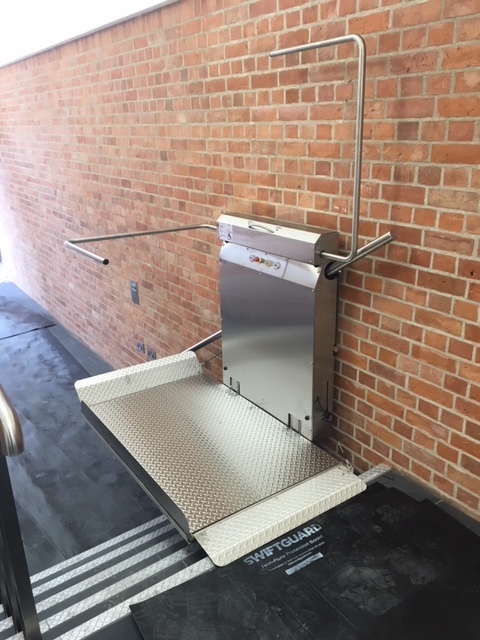 A disability ramp can be a good idea and can be cost effective. However ramps take up potential cover space and when profits are so tight like they are in the restaurant industry then 3 or 4 tables can make all the difference. 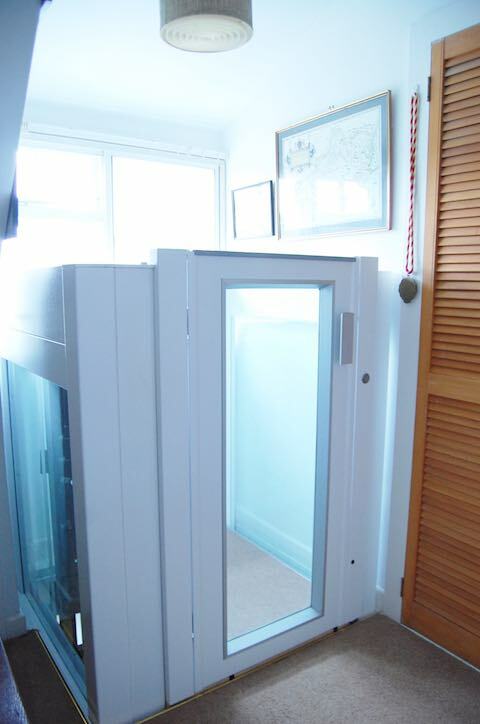 Alternatively a lift can answer the disabled access question and open up the space for potential covers. The word 'lift' usually brings to mind a large passenger lift that is in a stainless steel structure with automatic steel sliding doors. However a lift can be any platform that moves between two floor levels. 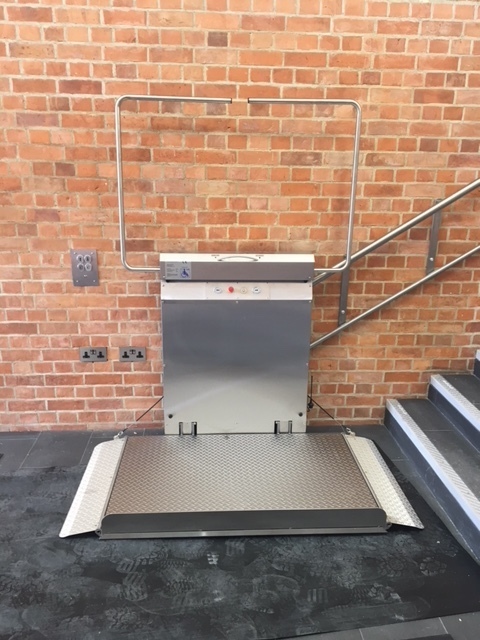 Finding the right disabled access lift when every square foot is vital to boosting sales can be tricky - restaurant owners are looking for lifts that have as little impact as possible but provide the necessary disabled access so that their restaurant is open to all. We provide a wide range of step lifts that cover short rises. 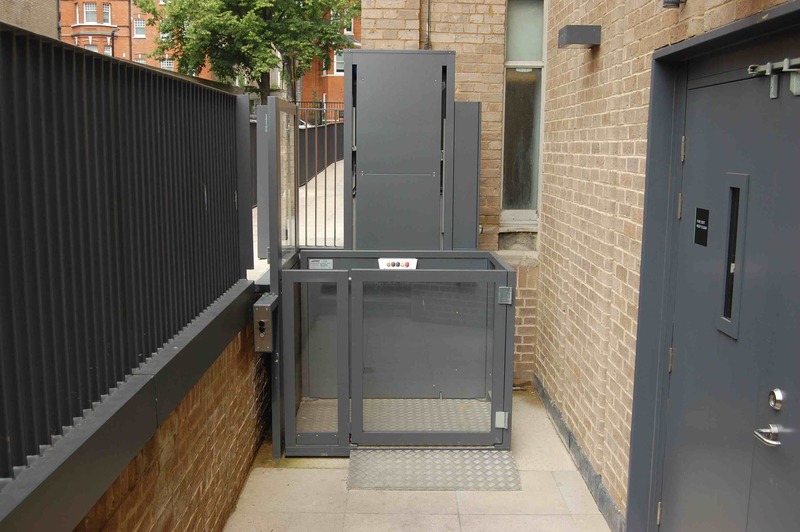 In addition we provide lifts for restaurants that have a second floor or mezzanine - this can open up previously inaccessible covers for wheelchair users and really boost a restaurant's profits. Most restaurant owners might initially be put off having a lift in their restaurant due to the cost compared with a conventional ramp. However disabled access lifts for restaurants are more affordable than you think. In comparison, for a restaurant with a floor level difference of 500mm from the street to the entrance a ramp's area will take up at least 165ft2. This space is wasted covers that have the potential to boost the restaurant's profits. We understand that for many owners and managers there is a tradeoff between the initial cost of installing a lift and the additional covers it opens up. That's why we see having a disabled access lift in a restaurant as an investment. It not only gives you back the space the ramp was taking up but for those restaurants that didn't previously have disabled access it opens up the restaurant to a large pool of new customers. 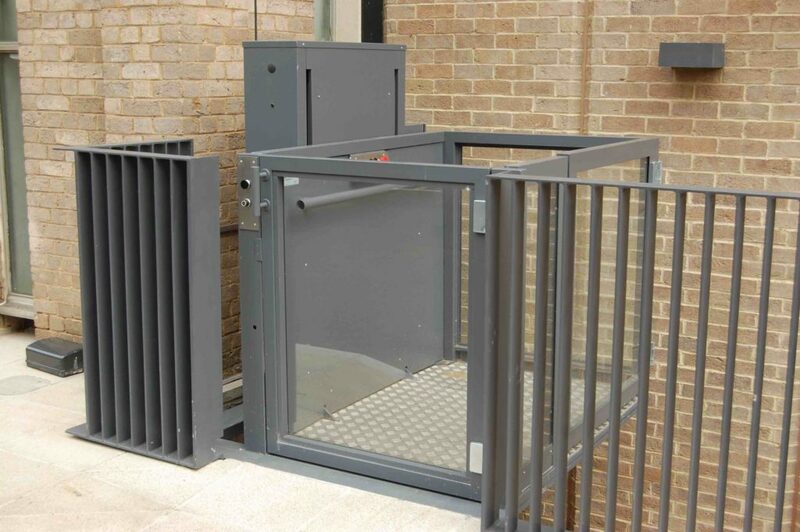 Functionality is at the core of disabled access equipment whether it’s a lift, a hoist or even a ramp. 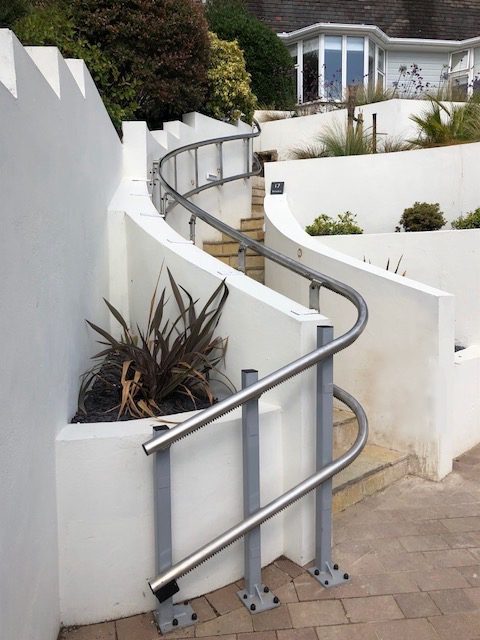 We believe that any disabled access equipment has to follow 3 basic principles: firstly, it has to be easy to use, giving as much independence to the user as possible, secondly, it has to be relatively quick to use and most importantly it has to be completely safe. These 3 principles come together to form the functional aspect of any disabled access equipment. With advancements in technology the majority of disabled access lifts now meet these principles but sometimes they are not tested in situ regularly. For example there are some situations where a disabled access lift is only used a handful of times each year. However when looking for the right lift for a restaurant, you need a lift that can stand up to daily use. The best lifts for restaurants need to be robust against the knocks and bangs that are common in a bustling restaurant or bar. We know that even with the most careful use, lifts can be knocked by staff and customers alike. That's why we look for and supply the best lifts on the market so that they're always up to the challenge and therefore last. In the past disabled access only used to be functional. Now creating a lift that matches the restaurant’s style and interior can be just as important as its functionality and sometimes it can become the priority. Major restaurant chains can undergo refits every 5 to 10 years therefore finding a lift that matches their new style is important. We've seen with some of our projects a shift towards industrial looking restaurants, with untreated metal becoming a more common style as well as bold vivd colours. With this in mind, suppliers and manufacturers are now providing more and more choice with finishes and optional extras. We understand that each project is unique in terms of appearance and all of our products are made to order to bring the client's vision to life. We also love adding intricate details such as mesh panels to our products to make sure they seamlessly blend into the surrounding aesthetics. We're seeing that fashion and style are having a greater effect on the world more today than ever before and even the lift industry is subject to it. We provide a variety of lifts for restaurants and build the lift around your vision creating a truly unique product. 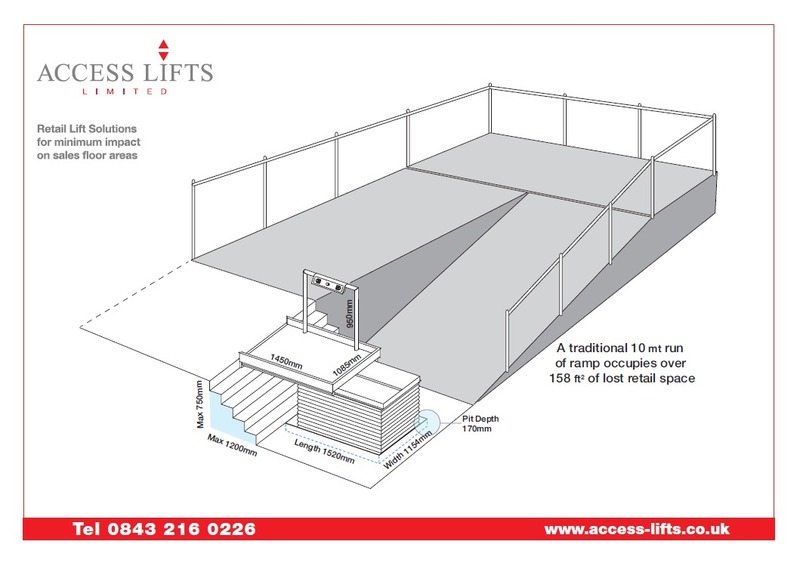 Our lifts vary from outdoor step lifts at a restaurant's entrance to hidden step lifts for an indoor set of stairs to a more traditional enclosed platform lifts to reach a second floor or mezzanine. Finding the right lift for your restaurant can be tricky and that’s why we’re here to help. For advice on your latest project or to get a quotation give us a call on 0800 65 252 65 or email us by clicking here. To see more of our work within hotels, restaurants and retail click here. To see more of our work in the hospitality sector click here. 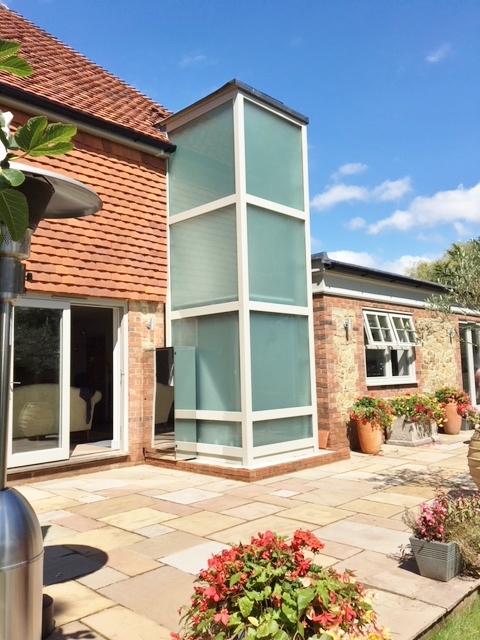 We were approached by a private client near Chichester in West Sussex because they were looking to fit a residential glass lift to the outside of their new home. The house had recently been built as part of a small development of half a dozen homes near to the Solent. They were looking to adapt their new home to make it more wheelchair accessible and chose to install a residential glass lift to the outside of the house. The client wanted a lift that was in keeping with the surrounding village's style but also matched the house's modern aesthetics. We designed and installed the residential glass lift in an external white structure in the the client's back garden - the lift was fitted to the outside wall with doors from the lounge on the ground floor to the landing on the first floor. 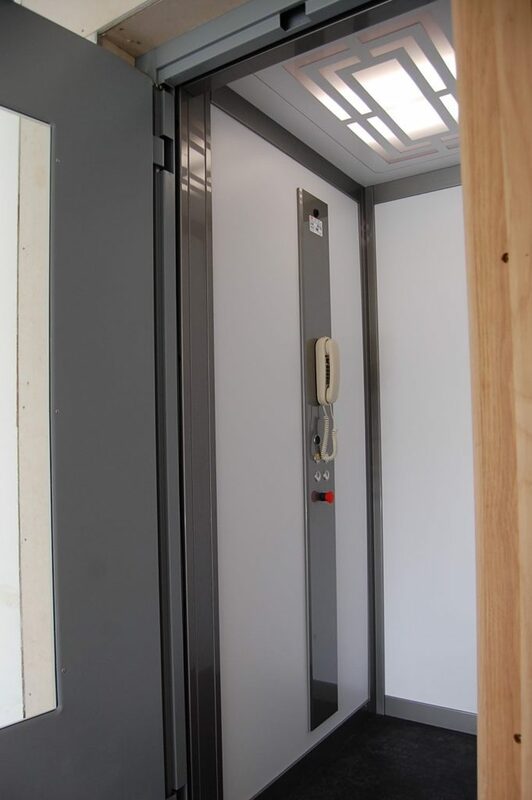 The lift's interior measures 1000mm x 1200mm giving surplus room for the client to use the lift in their wheelchair. The lift has a total travel of 3300mm across the two floors with entry to the lift only on one side and a safe working load of up to 400kg. 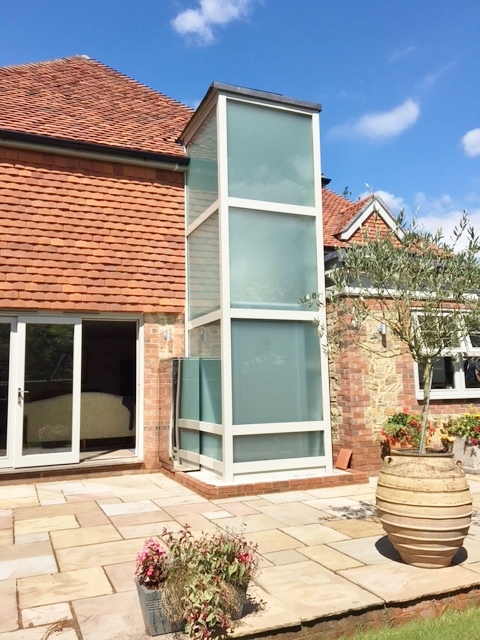 The lift was finished with opaque glass to add privacy from the neighbouring houses. 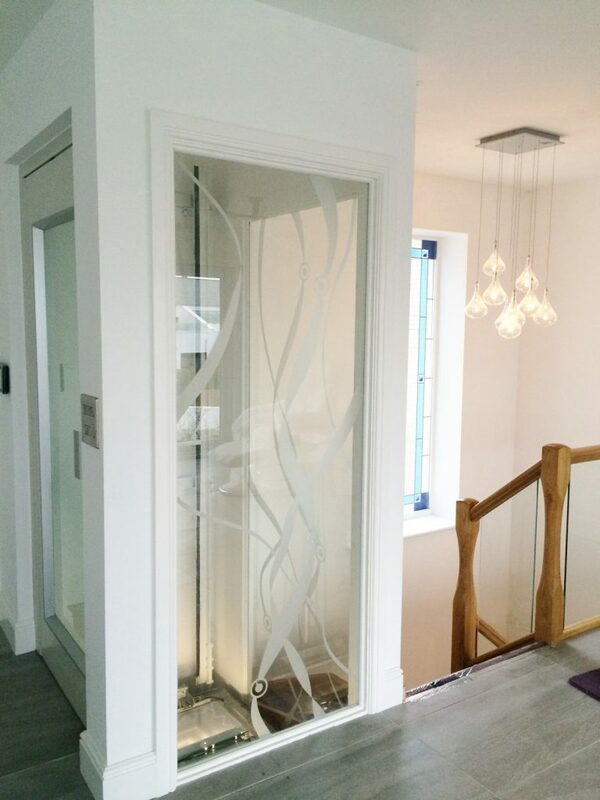 To see more examples of our glass residential lifts click on the following links: External Glass Lift in Branksome Park, Outdoor Lift in Powys, Glass Stairwell Lift in Torquay, Lift in Flats in Weymouth and Glass Residential Lift in St John's Wood. 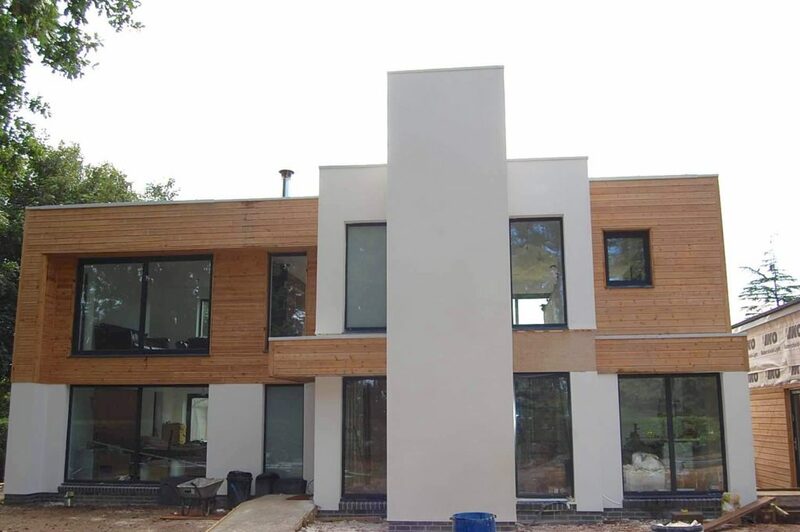 We were approached by a couple who had recently built their new home in Ringwood, Hampshire and were looking for a lift at the front of their property. Ringwood is a market town located on the Dorset-Hampshire border adjacent to the New Forest. The couple had built a lift shaft to the front of the property and were looking for the right home platform lift. This is when they got in touch with us to discuss the possible options available to them. They were looking for a lift that would match the modern aesthetics of their home and be able to stand up to day-to-day usage. After meeting with the couple and discussing their vision for the lift, our team created technical drawings of what the lift would look like and how it would fit in the shaft. After reviewing the plans, the client liked the design of the lift and gave us the go ahead to order the lift. 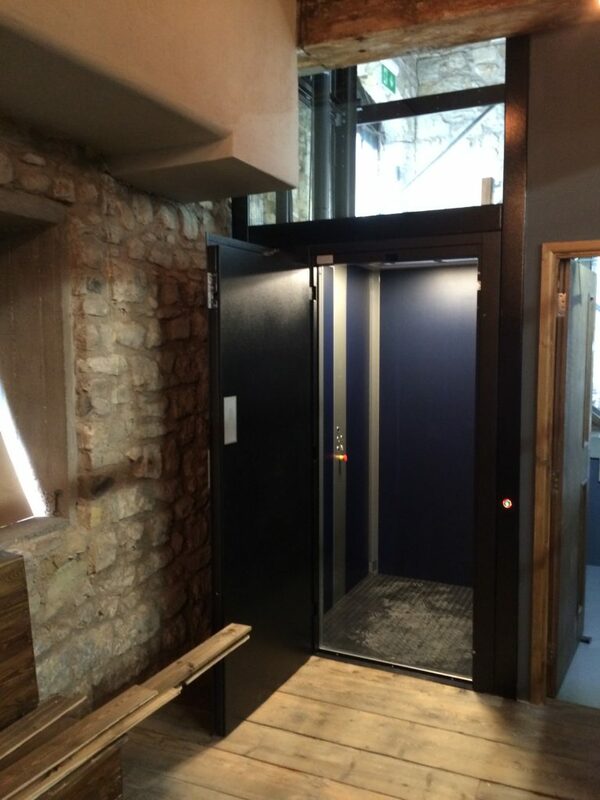 We designed and installed a home platform lift in the purpose built lift shaft. The lift travels nearly 3 metres from the hallway by the front door on the ground floor to the living-dining area on the first floor. The home platform lift has cabin dimensions of 770mm x 1060mm and a rated load of 300kg. 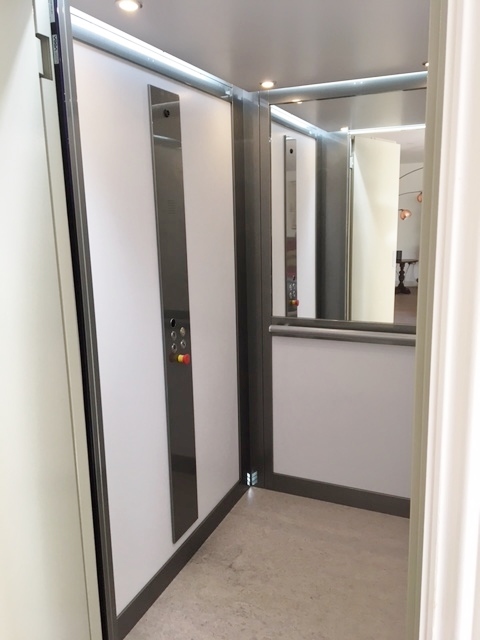 The lift was fitted with 750mm wide swing landing doors with glass windows to allow lots of light into the shaft and to give the lift a spacious feel. 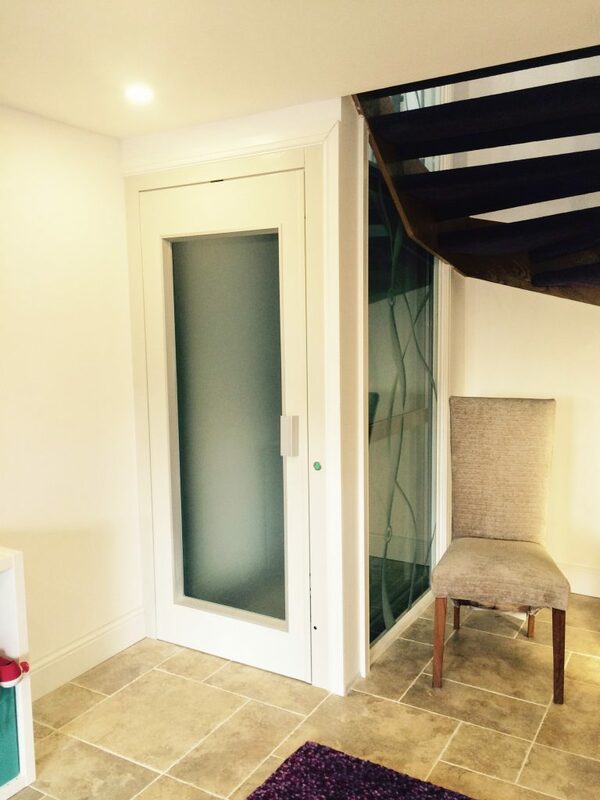 To see more examples of our home lifts click onto following links: Glass Lift in a Stairwell in Torquay, Small Domestic Lift in Mayfair, Glass Residential Lift in St John's Wood, Small Residential lift in Witchampton and Residential Glass Lift in Bosham. We were approached by BDP, the architecture firm responsible for the £23.75 million redevelopment of the National Army Museum in London. They were looking to fit platform lifts within the museum so visitors would be able to access every part of the museum and make full use of the new services. The refurbishment completely modernised the museum and they wanted a trio of platform lifts that would match the new look of the museum. 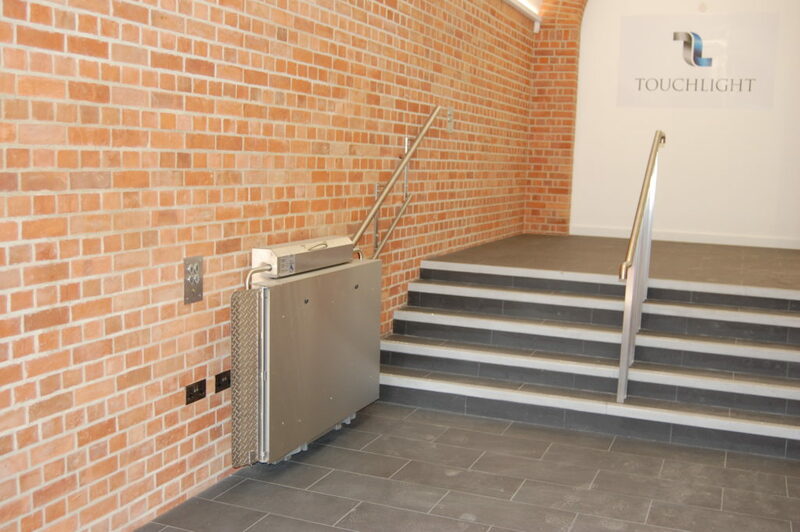 The locations that they needed to fit platform lifts were from the main reception to the education centre, to the Discover More gallery and for staff from outside the building to access the lower basement entrance. 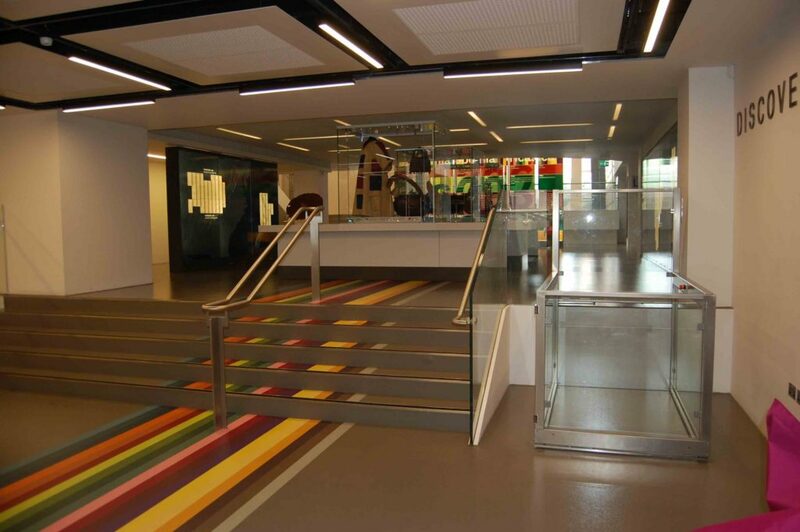 We designed and installed a Barduva RB150 between the main reception and education centre. This lift is mainly used for groups and school pupils who visit the museum and use the education centre. The education centre is a great tool where large groups can learn about British history from the Civil War up to the present day conflicts. 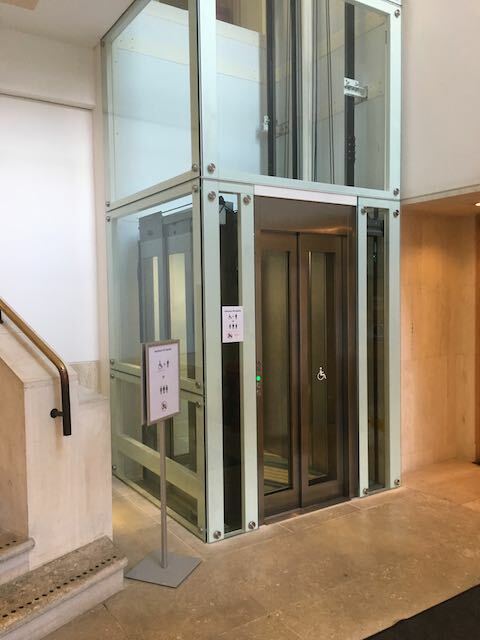 The lift was finished in stainless steel with glass panels to match the newly refurbished modern look of the building and the travel distance was 1.8 metres. 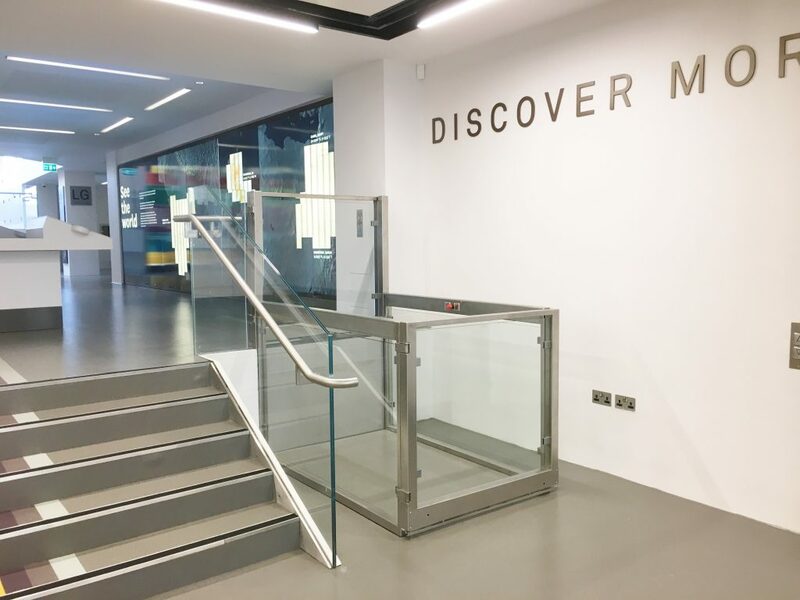 The lift we fitted and installed for access to the Discover More gallery was a LPA, it was also finished in stainless steel and glass to suit the new aesthetics of the building. 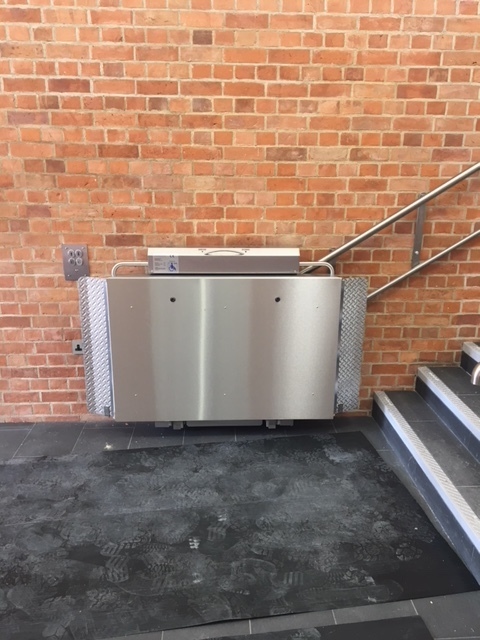 We chose to install the LPA as the cabin length is 1650mm so allows both a large wheelchair or mobility scoot and carer to easily and safely use the lift. The platform lift travels just 980mm but can hold a load of up to 300kg. 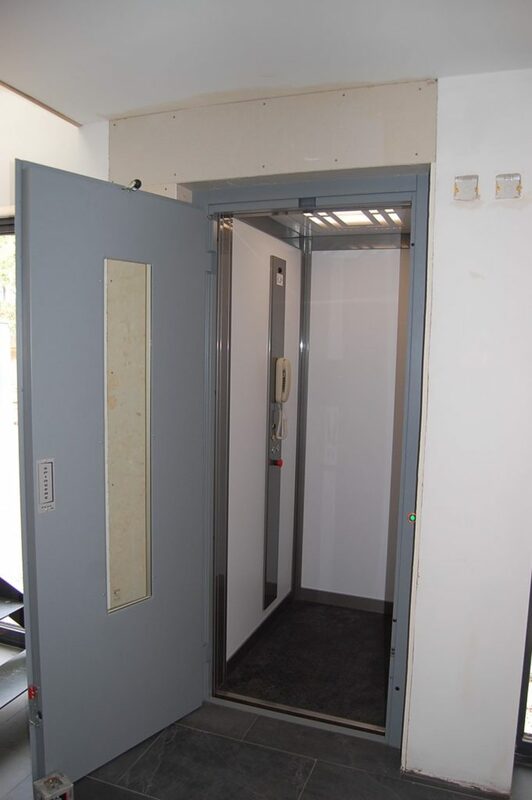 The third lift we designed and installed was for staff access from outside the building to the lower basement floor. 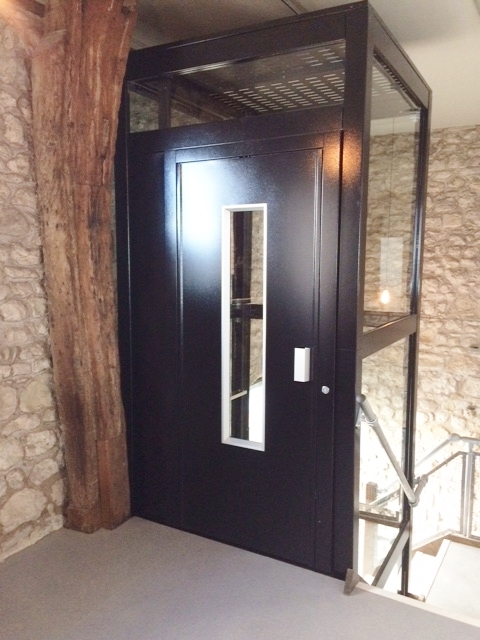 We chose to install an Alpine lift finished in 7016 painted steel with a travel distance of 1180mm. The platform lift that the client wanted was a cost effective product that would withstand any adverse weather conditions that could be thrown at it. The lift was fitted with an adjacent lower basement door. All three lifts were fitted within 2 weeks and were ready for the National Army Museum's Grand Opening in March 2017. 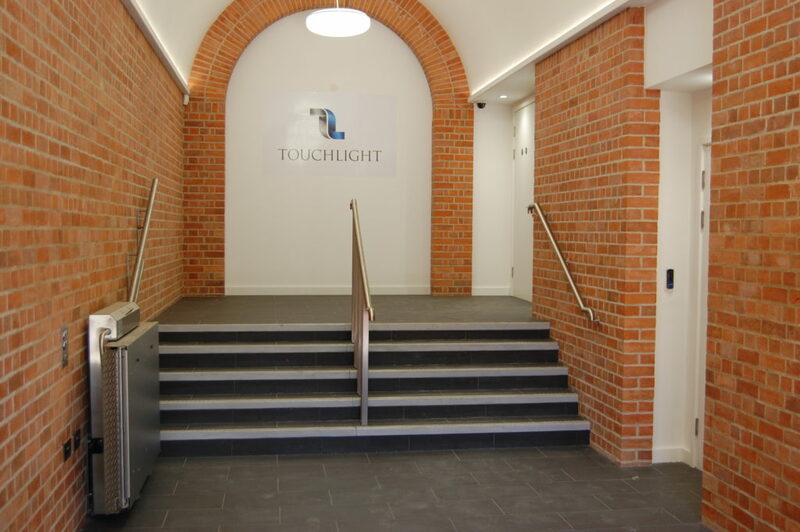 To see more examples of our platform lifts in commercial buildings, have a look at our Venture House, Seven Dials, Southwark Council and Chiswell Street projects. We were approached by Blackbottle Ltd, a building contractor, as they were looking to install a number of lifts at a site in Hampton. Blackbottle is responsible for the renovation and refurbishment of a Grade II listed Victorian waterworks located on the banks of the River Thames in Hampton. They are in the process of building several scientific research laboratories as well as premium office space for small, scientific-based businesses within the waterworks. The first lift that Blackbottle were looking to install was an inclined platform lift in the "Boilerhouse." 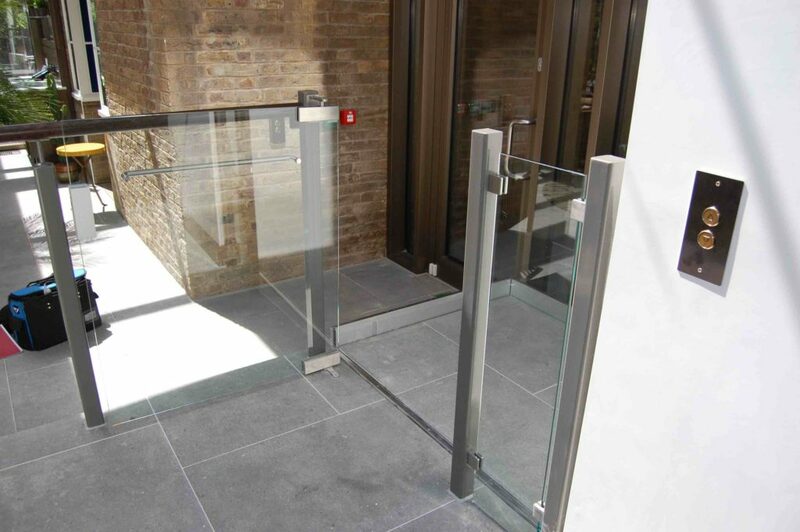 We are specialists in the installation of inclined platform lifts in listed buildings and have fitted a number around the country therefore we know that getting the right product and style is paramount. 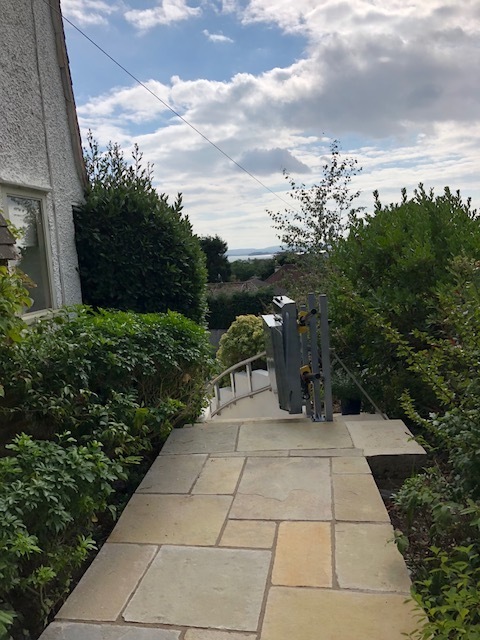 We designed and installed an inclined platform lift with a platform measuring 800m x 1200mm and a load capacity of 300kg with the lift travelling 1500mm up 5 steps. The large platform space allows for both electric-powered wheelchairs as well as smaller manual wheelchairs for visitors and workers of the businesses within the building. 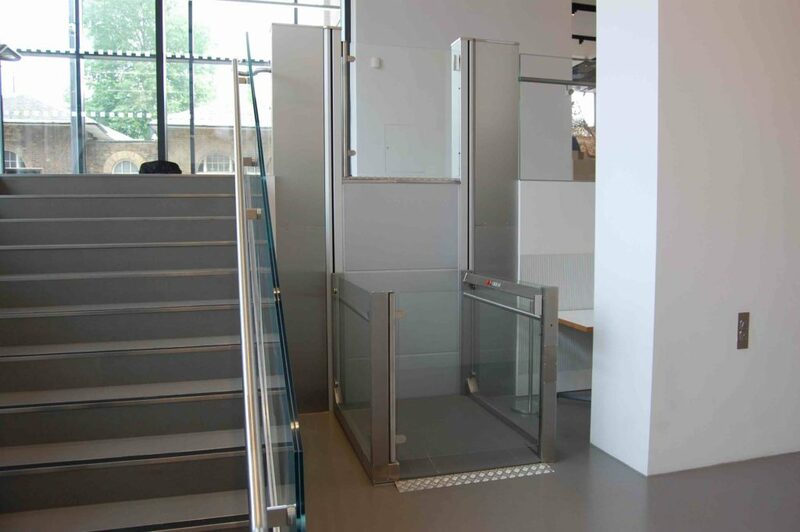 To see more of our inclined platform lifts in listed buildings and other lifts in listed buildings then click on the following links: British Library, National Army Museum York Theatre Royal, National Theatre and Dancing Man Brewery. 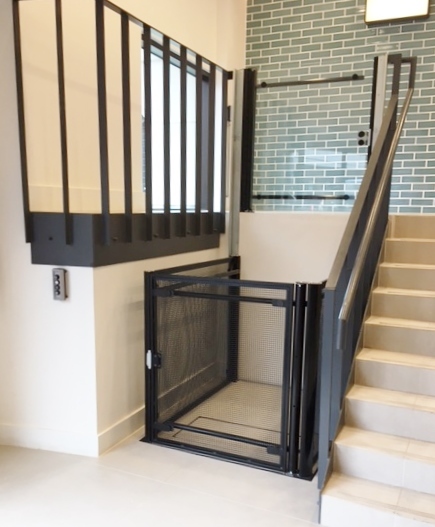 We were approached by a private client who had already built a lift shaft next to his staircase and was now looking to have a lift installed. We went to the site in Whitecliff, Poole to measure the internal structure and discuss his vision and exactly what he was looking for. Whitecliff is a sought after area and overlooks both Whitecliff Park as well as Poole Harbour. The majority of the houses around the park are very modern with glass being a prominent feature across the whole Whitecliff-Lilliput-Sandbanks area. He wanted a lift that would match the aesthetics of his home and so wanted a style that was light, airy as well as being modern. We fitted an EP Elfo within the prebuilt lift shaft with the home lift travelling a total distance of 5970mm across 3 floors with a maximum load of 300kg. The internal cabin measures 850mm x 1100mm with 800mm glass swing doors on each floor. The door structure was painted white to match the colour of the lift shaft with the glass within the doors specially made to include a wave-like pattern. On the upper floor there was glass on 3 ides of the lift to allow as much natural light as possible into the lift shaft. The lift was fitted with adjacent entry on 2 sides. 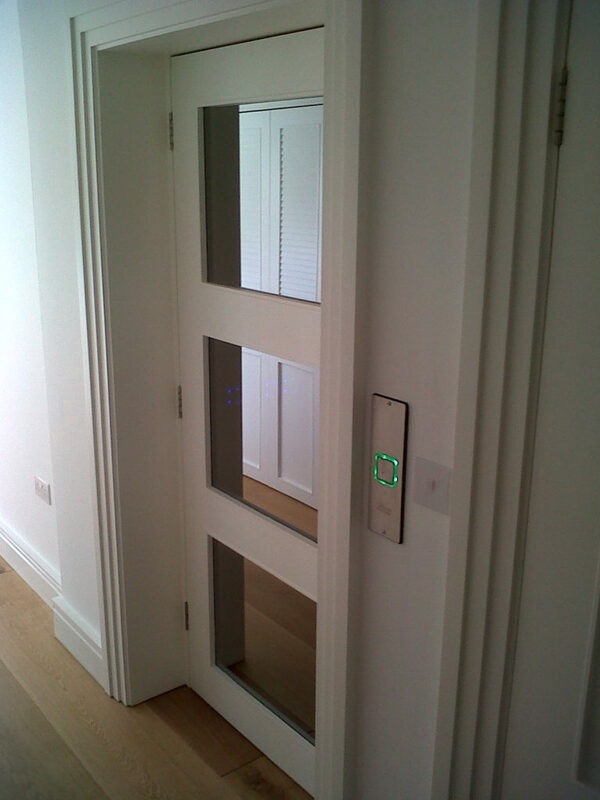 This home lift was fitted within 2 weeks. 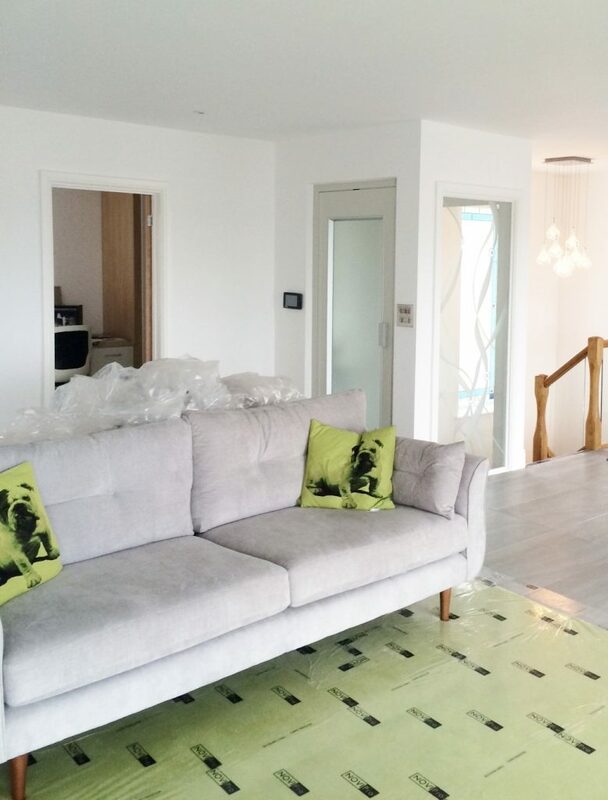 To see more of our home lift projects have a look at our Branksome Park, Torquay, Westbourne and Powys projects.